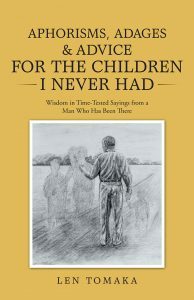 Author Len Tomaka reveals to you the Aphorisms, Adages & Advice for the Children I Never Had. Discover wisdom in time-tested sayings from a man who has been there. Learn valuable lessons from his rich experiences and be inspired to pave your own path to improve your future. In this slim volume, he does exactly that. Tomaka offers one idea/saying per page. The entries are organized into four categories (Behavior, Work, People and Tidbits) and give the sort of advice a parent might often impart to a child. For example, in a passage titled “A Reputation Takes Every Minute to Build,” the author advises: “Do not lose your reputation with one indiscretion. That one imprudent act, social or professional, can erase all that you’ve worked to obtain.” Other sample passages are titled “First Impressions,” “Don’t Put All Your Eggs in One Basket,” “Rank Has Its Privilege” and so on. As such titles indicate, many of the passages offer advice that most readers will have already heard, probably repeatedly. But occasionally, the author surprises with offbeat practical suggestions, noting, for example, that readers double any estimate on a remodeling project, chew sugarless gum after meals to clean their mouths and use shoe trees to keep their shoes attractive. While these may be helpful thoughts, the shift between practical issues and more lofty ideas lends an uneven feel to the volume. Despite such drawbacks, the book is nicely laid out and well-edited. Although much of this advice is widely available elsewhere, the author has a reassuring and kind fatherly voice that might appeal to new college graduates or those starting life over after big changes. Tomaka passes helpful life advice on to others in this appealing collection. Children I Never Had, a book full of helpful tips. share with a larger audience. It is organized into four sections, “Behavior,” “Work,” “People,” and “Tidbits,” each of which offers typical bits of knowledge or advice. For example, in “Behavior,” the largest section, the focus is on common phrases like the aphorism “[A] bird in the hand is worth two in the bush.” The “Work” section concentrates on advice for life in the workforce. Here, Tomaka warns about knowing your place in the office and the power of seniority. appealing and genre-appropriate format. Often, Tomaka will reference insightful information about the origin of a proverb, though he also openly admits when he is unaware of a saying’s source. experiences to explain quotes, alluding to his time in the workforce, lessons from church, and things he learned playing sports. The book covers a variety of subjects that touch on everyday life, like the dangers of too muchtelevision or the importance of first impressions. Some subjects, like racism and sexual assault, feel out of place and are too heavy for a book whose purpose is to express simple life lessons and that cannot adequately address such issues. The majority of the included quotes are relatable and can be applied to a variety of circumstances, though some are intended for more specific readerships, like young men or office workers. Much of the information is repetitive and would fit appropriately into any of the book’s sections. For instance, many of the quotes in the “Tidbits” are the same as examples from previous chapters, though worded differently and with different life experiences in Tomaka’s descriptions of them. The book’s tone is direct and unapologetic. Grammatical, punctuation, and spelling errors are a distraction. A helpful table of contents makes it easy to find particular pieces of knowledge. Aphorisms, Adages & Advice has a simple layout and contains delightful phrases that lend it wide appeal. Tomaka’s collection is appropriate for an audience interested in passing on helpful advice to others. Copyright © 2016. Len Tomaka. All rights reserved.